And now for something completely different! I’d like to make the case that we should take intra-city and inter-city trains more often. (I mean this especially for Americans, since trains are already more popular and more advanced in many other countries.) As some of you know, I like riding trains, and I even thought of writing an “ode to trains,” but though I enjoy poetry—which is virtually required of me as a half-Persian—I don’t think I write it particularly well. One of my first memories as a boy was riding a train in Colorado and sticking my head out the window, only to get a face full of smoke. I’m a fan of blues, folk, and jazz music too, and many musicians (such as Woody Guthrie, Muddy Waters, Johnny Cash, Bob Dylan, Joan Baez) have sung train songs. This post is also partly inspired by an interesting and entertaining article by Kevin Baker in the July 2014 issue of Harper’s magazine. My carbon footprint has been particularly large this year, and I hope to do better next year. I plan to begin by considering taking a train from southern California to Seattle for the annual meeting of the American Astronomical Society (AAS) in early January. Long-distance travel is also an issue being taken up by the AAS Sustainability Committee. If you’re wondering, this trip would take most of a weekend, but it would offer nice views of the Pacific coast and the trains have free wireless internet too. 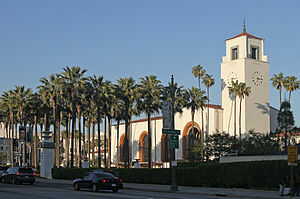 It looks like the Coast Starlight line takes about 34 hours to travel from Los Angeles’s historic Union Station (pictured below) to Seattle’s King Street Station, but it covers a distance of 1377 miles (2216 km)—nearly the distance between the borders of Mexico and Canada. We should keep in mind that, after walking and biking, trains are the most efficient way to travel. Amtrak, the US’s publicly funded railroad service, expends an estimated 1,600 BTUs of energy per passenger per mile, while buses use 3,300, planes use 2,500, and cars use 3,900! If we seriously want to use less energy and substantially reduce carbon emissions, we should travel by train much more often. From the perspective of climate change, although “carbon offset” programs have been attempted (with very limited success so far), nothing beats not emitting greenhouse gases in the first place. The US needs to upgrade and expand its train lines and cars. Europe and China have trains that are at least twice as fast as ours, and Japan’s new Shinkansen bullet train goes 200 mph! Americans sometimes complain that the country is too big for trains, but China shows that it’s certainly possible. I think we need to push for high-speed trains, especially in California and the East Coast but also within the country, such as the California Zephyr line that links the Bay Area, Denver, and Chicago. This will take a lot of investment and time, but it will be worth it. Although the US auto industry has suffered in recent years, improving and expanding the rail system certainly would help the “green economy” and create many “green jobs”. And we should keep in mind that annual federal highway and aviation subsidies are currently gigantic ($41.5 and $16 billion in 2013, respectively) compared to Amtrak subsidies ($1.6 billion). The planned California high-speed rail will cost an estimated $68 billion to construct, but it will be built over many years. Thanks for your comments, Henry! Yeah, it’s true, the geographic area is a bit “large” in the US and Canada, as you say, and that makes things difficult. 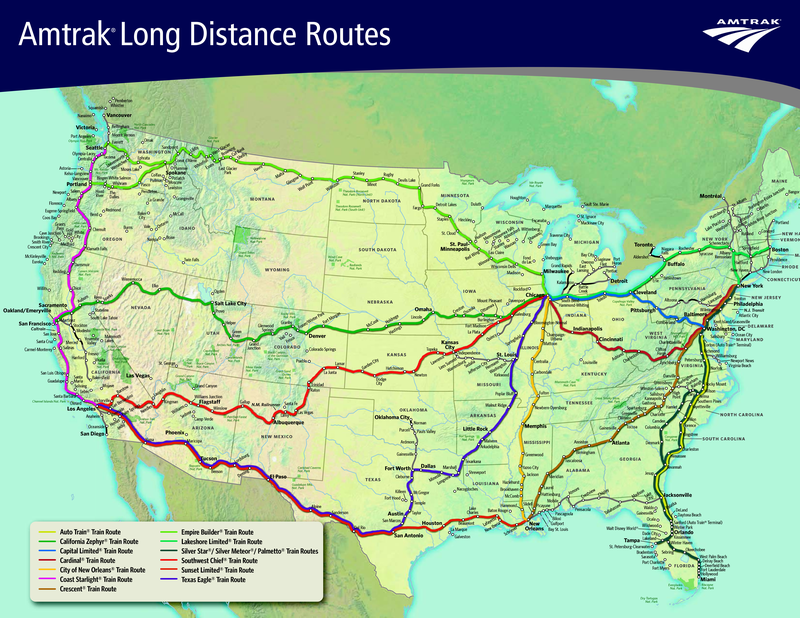 A high-speed train on the east coast and west coast of the US would be awesome though–imagine going from San Diego to Vancouver in a single day! Unless planes somehow become extremely energy efficient, in the future we might have to view quick long-distance travel as a luxury.